The Abtech BPGA range offers three designs of BPG enclosure in two different sizes. 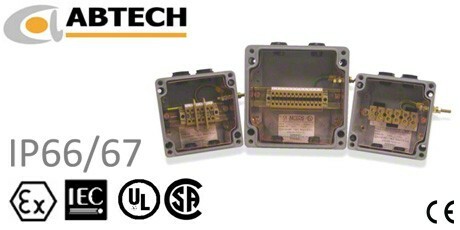 BPGA enclosures are available pre-assembled from stock. The BPGA enclosures are suitable a range of applications including lighting, power and instrument junction boxes. BPGA Enclosures are produced from impact resistant glass-reinforced polyester and ae supplied complete with terminals for each individual box (see Abtech specification tables), copper earth continuity plate and are also fitted with a brass M6 internal/external earth stud. Each enclosure is supplied pre-drilled with four M20 tapped cable entries and also includes EEx’e’ certified blanking plugs. Abtech BPGA Enclosures are ATEX certified EEx‘e’ and are suitable for use in Category 2/Zone 1 and Category 3/ Zone 2 areas according to EN 60079-14 with a working ambient temperature of between -20°C and +40°C (-4°F to 104°F). The BPGA range offers excellent ingress protection qualities rated to IP66/67. In addition the BPGA Enclosure has passed the Shell/ERA deluge test which was designed to properly test enclosures and electrical equipment which is routinely subjected to conditions on ship decks or from fire deluge systems.